Dry roast all these whole spices for few seconds. When whole spices are almost roasted, add 1 tbsp coriander powder/ whole coriander seeds and roast for few more seconds. Be careful spices should not get burnt. Grind all the roasted spices. Take out grind spices in a bowl. Add 2 tbsp curd, salt and lemon juice to spices. Marinate the chicken pieces with this paste. Keep it marinated for 2 to 3 hours. Now heat 1 tbsp oil in a pan. Add a pinch of Hing and one Bay leaf. Add onion paste and saute till it turns light golden. Now add ginger garlic paste and saute till raw aroma goes off. Add 1 tsp Turmeric/Haldi powder and saute for few seconds. Now add marinated chicken pieces. Roast it from all sides. Now cover and cook chicken with stirring on intervals. Cook it like this until chicken is cooked completely. Garnish with sliced onion, lemon and curry leaves and serve hot. 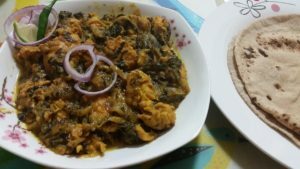 A Delicious Chicken recipe prepared with fresh Methi/Fenugreek leaves. First marinate chicken with all the ingredients mentioned above under marination. Keep aside for 10-15 minutes. Now heat oil in a pan. Add whole spices (Cumin/Jeera seeds, Bay Leaves, Cinnamon stick,Green Cardamom, Black Cardamom) to it. When whole spices starts spluttering, add sliced onion to it and saute until onion becomes light golden in color. Add all the methi/fenugreek leaves to it and saute for 2-3 minutes. Now add marinated chicken to it. Mix well. Add green chillies. Cover and cook until oil getting seperated.It will take approx 5-7 minutes. Keep stirring in between. Now add garam masala and two cups of water. Again cover and cook for 5 minutes. Turn off the flame. Let it rest for 5 minutes. 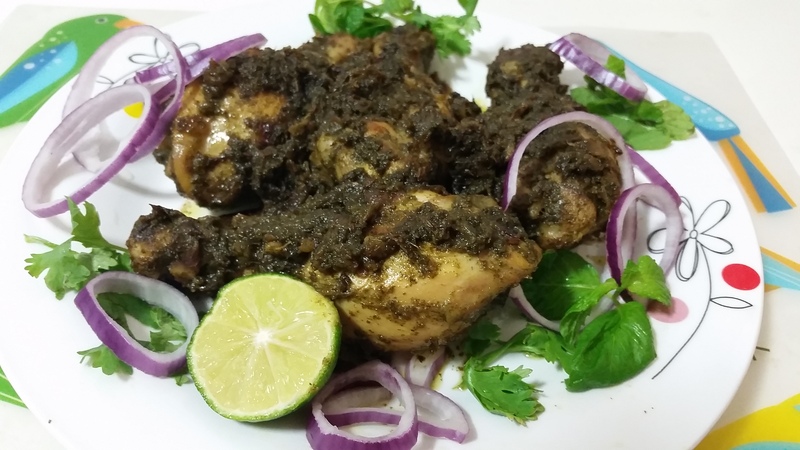 Serve Methi chicken with roti, naan or rice.